Welcome to Firenock’s take on broadheads for archery projectiles. The invulnerable fixed broad-head for high speed crossbows. Let’s strip back everything that we presume about broad-heads. At its core, according to the Merriam-Webster dictionary, a broadhead is “a flat, pointed arrowhead having sharp edges and made of steel.” Four significant characteristics are mentioned in this definition - 1) pointed, 2) sharp and 3) steel. Of these three, all four have been re-thought and re-defined to actualize Firenock’s take on crossbow broadheads: The Traumahawk. Often, when the quality of a broadhead is discussed, its ability to pass through an animal is directly correlated to one’s opinion of the broadhead. If we apply such a system of thought to the Traumahawk, most people’s opinion would be really low. Why? Because our crossbow broadhead is not meant to “pass through” an animal at all. Instead, The Traumahawk’s design is based on the concept of blunt force trauma. Blunt force trauma. When most hear this phrase the first thing that comes to mind is usually some sort of injury, often quite serious. Such an understanding is definitely relevant here. Blunt force trauma is defined as the "initial trauma." See, unlike most broadheads that boast how pointed or sharp they are, as you can see in the image on the left, Traumahawk is not pointed -- its literal "point", if you could even call it that, is in fact an edge. Designed to working a bit like the Native American’s lethal weapon, the tomahawk, our broadhead is designed to transfer the maximum amount of kinetic energy in the initial or first contact of your arrow to the game. Traumahawk, all in all, is designed indeed not to pass through but tear through. Let's get to the specs. Made of solid stainless steel and weighing 175 grains (11.34 grams), the Traumahawk is machined through a high-pressure precision, die-cast process. This casting method results in a much stronger and tougher steel than machined or MIM (Metal Injection Molding) processed pieces of typical bar stock. To ensure concentricity when you are installing Traumahawk on your crossbow bolt, Traumahawk is also equipped with our US Patented Firenock Arrow Concentric Technology (FACT™), which includes the Double O-ring System on the neck of the Traumahawk to establish perfect concentricity once assembled, every time. 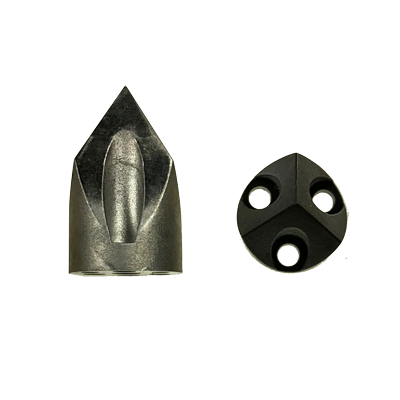 The compound single bevel grind (SBG) fixed broadhead for vertical or crossbows. Though Dagger is in fact designed with a compound bevel, it is important to start at the beginning -- with a simple bevel. Simply put, a bevel is a constant slope. In the instance of a weapon or more specifically a broadhead, such bevels are used to create a point or sharp edge. These usually involve double beveled edges, defined by a slope on both sides of a broadhead. Here is where the Dagger differentiates from all others -- it does not have a slope on both its "sides," it has a total of six complex beveled edges on all sides. See, a simple bevel involves, as aforementioned, a constant slope. Complex bevels, on the other hand, have multiple slopes. To clarify, the Dagger has two complex bevels on each of its sides and then two at its base. Each with its own individual slanted slope, these six bevels work together, are compounded, to provide rotation not only during initial contact with the game but all the way through the animal. Specs. As always, Dagger is made of solid stainless steel machined through a high-pressure die-cast process. This casting method results in much stronger and tougher steel than machined or MIM (Metal Injection Molding) processed pieces of typical bar stock. To establish perfect concentricity during assembly, like Traumahawk, Dagger is equipped with FACT™, involving the Double O-ring System on the neck of the Dagger. The 125 and 100 grain Dagger is 4mm/0.157" and 3.15mm/0.124” thick, respectively. Due to design and manufacturing process it is hard to be exact weight, but we shall make sure the Dagger 125gn weight can vary from 124 to 131 gn as indicated on each 3-pack. Through QC we make sure each package is to be +1/-0gn as indicated on each package, and you can pick the weight you prefer within 1 grain for tuning your perfect set up. That is if you want your arrow to end up to be 420gn and 6 of them at 296gn and 289gn respectively, you can get a pack of 124gn and 131gn each to make it the exact weight without needing to add any weight spacer(s). While Dagger 100gn is weight from 98 to 102 gn and each pack is sorted to be +1/-0 grains. Dagger Titanium (Ti) is made from one solid piece of GR5 titanium paced through a high-pressure die-cast process. Just like for its heavier cousin, this casting method is about the only way the complex geometry of it can be made correctly. The Dagger Ti is identical to the 125 grain SS Dagger in shape and size but weighs in at 85 grains. This weight makes it the ideal broadhead for those who are using the AeroConcept 1.0 and/or 2.0 system due to the additional weight caused by the carbon inner tube(s) in your arrow. To establish perfect concentricity during assembly, like Traumahawk, Dagger, and all Firenock field points, Dagger Ti is also equipped with FACT™, involving the Double O-ring System on the neck of the Dagger. SwingBlade™is a mechanical broadhead that utilizes a deployment system never before seen. As its name implies, the three blades on a SwingBlade deploy by swinging out from their clasped position upon impact. This design allows it to be used on high-speed archery projectiles (550 fps) with accuracy due to a minimum crosswind signature during flight (3/4" for Falcon & Raptor blades). As shown in the adjacent diagrams. Further, designed as a completely interchangeable series, the head, blades, and bodies can be field swapped. As of the 2018 release, there is currently one head. The SwingBlade standard head is made of stainless steel. It has a sharp edge pyramid design. The three channels of the head are deigned to allow the screws that unite the head with the body to be flush to the base of the head for structural integrity. These channels additionally lower the surface contact, acting instead as air ram chambers and blood flow channels during its cutting phase. As of the 2018 release, there are two blades available for purchase, the Falcon and Raptor. For 2019 a third blade Talon is introduced. All three blades utilize the single bevel front and back design. They all are made of 0.5 mm/0.020" thick stainless steel. When SwingBlade is equipped with Falcon Blades, it is the quietest of all Firenock broadheads. Though these blades are designed with a high cutting angle, there is still a minimum amount of drag effect when it passes through wind. As of 2019, all Falcon blade are made out of 420 Stainless and hardened to no less than 55HRC. The original Falcon blade are made of 303 stainless and is 19 HRC. The Talon Blades which are new for 2019 was designed to satisfy those vertical bow shooter who demands a wider cut but will not need the aerodynamically demand of high-speed archery projectiles that can exceed 330 fps. This is especially true when the archery projectile was equipped with Aerovane III which can exceed 300 revolutions in every 20 yards after passing the 60-yard mark at 400 fps... The Talon blade however can open as wide as 42 mm/1.67 inches but still have a close-up flight patent of a 30mm / 1.175" fixed blade head. Just like the Falcon blade, the Talon blade is also made of 420 Stainless and harden to at least 55 HRC. The Raptor Blades were designed to address stringent no-barbing laws. Although all SwingBlade blades utilize the same front and back single bevel design, the fact that the back side of the Falcon and Talon blades exceeds 90 degrees can make it illegal to use in some states. Thus, the Raptor Blade has a backward angle of precisely 89 degrees to rectify the legal issue. As of the 2018 release, there are three bodies available for purchase, the aluminum, and two stainless steel. All three bodies, like all Firenock broadheads and field points, are equipped with FACT, our patented Double O-ring system that helps self-concentricity. The aluminum body will weigh 22 grain while the two stainless will weigh 47 grain and 72 grain to form 75, 100 and 125-grain complete broadhead respectively. For simplicity, the last digit of the item code is A, S, and H, which stand for Aluminum, Stainless, and Heavy Stainless. Recently, we noticed that many field points and broadheads on the market are not exactly the same weight as claimed. Some 100 grain broadheads are actually 96 grain, and we’ve found some up to 8 grains heavier than advertised. We also noticed that some inserts are not deep enough to accommodate a point, causing a small gap to appear. To address these issues, we now offer Copper Crush Spacers. Available in four sizes, see the chart below. As their label suggests, these spacers are designed to perfectly align your broadhead according to your own personal configurations. See, often times, when you fully screw in your broadhead into an insert, the broadhead will not sit where you’d like it to. Available in 5 sizes as seen in the chart below, these GR2 titanium spacers all weigh less than a grain, and will allow you to add just enough space to turn your broadhead that much more. The Aluminum Slant Spacers are a companion product to most broadheads and field points. 0.5mm thick, these spacers are "slanted" in shape with one side boasting a diameter of 8mm and the other 9mm. With this unique shape, one can easily relieve the diameter difference between common vertical bow arrows (8mm) and crossbow arrows (9mm). For long-term durability and good looks, these 0.82+/-0.03 grain spacers are made of 7075-T5 aluminum and are Type II hard anodized.